Donald Trump has just unshackled Iran from its commitment to mothball most of its nuclear program in exchange for relief from economic sanctions. He has wilfully unravelled a historic diplomatic triumph and arms control milestone—which Iran signed in 2015 not just with the US, but with all five permanent members of the UN Security Council (plus Germany)—and may have primed a new detonator in what’s already the most combustible region in the world. The erratic US president continues to unpick the legacy of Barack Obama, the predecessor he despises: withdrawal from the Trans-Pacific Partnership; pulling out of the Paris climate change accord; and now this histrionically muscular act of geopolitical arson—in the same month that he’s moving the US embassy in Israel to Jerusalem, burying a two-state solution to the Israel–Palestine conflict. 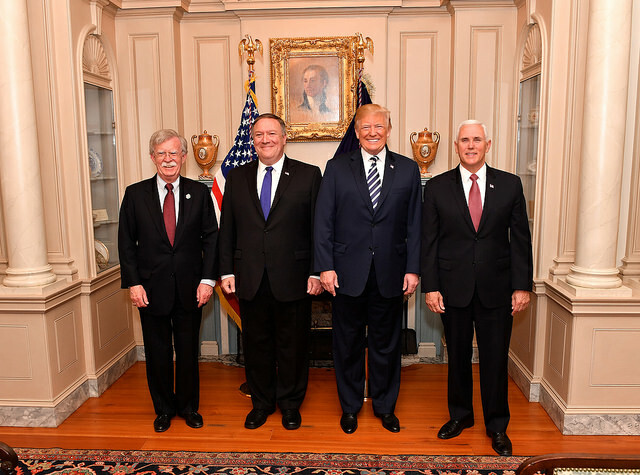 Flanked by this chaotic White House’s recent new signings—ultra-hawks Mike Pompeo as secretary of state and John Bolton as national security adviser—Trump has all but called for regime change in Iran. Bolton, lest we forget, doesn’t believe in arms control . This former ambassador to the UN, who doesn’t believe in multilateralism either, said on the eve of the invasion of Iraq in 2003 that the US would ease itself out effortlessly within six months, and more recently argued that the solution to Iranian nuclear ambitions is to bomb Iran . Indeed the echoes of the build-up to Iraq—and the shared belief in bombing your way to a better future—are alarmingly uncanny . What these pyromaniacs have actually done is to re-legitimise hardliners in Iran grouped around the Revolutionary Guard (IRGC), the judiciary and the theocratic leadership. The 2015 accord re-energised the drive for change inside Iran. The IRGC and its supporters are now exulting after Mr Trump has come to their rescue by scuppering it. The pragmatist camp led by President Hassan Rouhani, architect of the accord, has been politically crippled. How can they still argue Iran should continue to honour an international deal the US simply ripped up—and systematically undermined  anyway through secondary sanctions—or even stay inside the nuclear Non-Proliferation Treaty (NPT), to which Iran, with no atomic bomb, is a signatory but Israel, it nuclear-armed enemy, is not? Trump’s decision is also shredding the already badly frayed transatlantic alliance. He’s not just breaking an agreement endorsed by the UN Security Council. He’s threatening key US allies—France, Germany and the UK—and their companies and banks with sanctions unless they cease doing business with Iran within six months. China  and, to a lesser degree, Russia, may shrug this off. For Europe, this is an historic test. It was the EU—starting 12 years ago when Javier Solana ran its foreign policy—that kept open lines to Tehran that enabled John Kerry to clinch a deal with Iran in Obama’s second term. Twenty years ago the EU successfully resisted US attempts to punish European businesses under the Iran and Libya Sanctions Act of 1996. That was under Bill Clinton, yet even George W. Bush sought to avoid clashes with its partners and continued the waiver policy. The EU says it will act to protect its businesses. But the threat of excommunication from the US market and banking system through the extraterritorial reach of the US Treasury will shut down most trade and investment . It will be hard for Europe to keep Tehran engaged and inside the nuclear deal unless it can offer some sort of quid for Iran’s quo. But the alternatives are truly bleak. Within hours of Trump’s decision—which had been egged on by Israel and Saudi Arabia—the Israeli air force struck what it said were Iranian targets south of Damascus (satellite imagery of which had been provided to Fox News in late February, a procedure now considered virtually a prelude to an air strike ). Israel has stood apart from the Syrian conflict, but attacked more than 100 times what it says are Iranian arms depots and convoys in Syria intended for Lebanon’s Hezbollah, the Shia paramilitary power Tehran has sharpened into its regional spearhead. But the 8 May attack took place after Trump’s nuclear demarche. Tehran evidently felt it had to reply. On 9 May, its Quds Force, the expeditionary unit of the IRGC, fired 20 missiles into the Golan Heights, Syrian territory that Israel occupied and annexed after the 1973 Arab–Israeli war. Israel responded with a devastating wave of air strikes it claims hit all of Iran’s assets in Syria—the worst confrontation in Syria since 1973 and the first direct conflict between Israel and Iran, raising the spectre of a new regional war spinning out of the vortex of the Syrian civil war. These may be warning shots. Israel has said it won’t tolerate Iran and its proxies establishing a permanent presence in Syria, where alongside Russia’s air force they have salvaged Bashar al-Assad’s regime from the rebellion that began in 2011. Nor can it live with Hezbollah’s growing arsenal of missiles that can reach deep into Israel, especially if fitted with precision guidance that it says Iran is enabling at facilities in both Syria and Iran. Iran, which has gradually built a Shia corridor through Iraq to Syria and Lebanon to the Mediterranean, has crept ever closer to Israel’s borders. It’s also using its paramilitary muscle to consolidate political power and win a degree of legitimacy through popular endorsement of its proxies and allies at elections this month in Lebanon  and in Iraq. The sudden and brutal eruption of Islamic State after 2014, and the perception that US allies such as Saudi Arabia were betting on Sunni jihadism, has also won Iran and its friends prestige, especially among the region’s minorities, as a shield against IS barbarism. Iranian propaganda exploited this, pushing a story that but for Iran and its ‘resistance’ forces such as Hezbollah, the black banners of the jihadis would be flying over Baghdad and Damascus, and IS would have broken into Beirut. Like all good propaganda, it contains a kernel of truth. But even the hardliners in Tehran are pragmatic. They’ll want to respond but not put at unnecessary risk their regional gains. Yet there’s now a clear danger that the game of chicken going on close to Israel’s borders could turn Syria—and probably Lebanon—into a battlefield between Israel and Iran. Some strategists think this would be so destructive, including to Israel, that a sort of balance of terror will prevent it. Others speculate  that—precisely because each side can so badly damage the other—both might be tempted into a first-strike offensive. President Trump, cheering for regime change, has made a bad situation very much worse. As the International Crisis Group argues in a recent analysis  of Iran’s regional motivations, ‘the negotiations that led to the nuclear deal … succeeded not only because sanctions had inflicted acute pressure on Iran’s economy, but also because the US took regime change off the table’. The power that may be best placed now to talk Israel and Iran down is Russia, which maintains links with both sides. Trump, with the self-satisfied flourish of the signature he so delights in showing the camera while surrounded by fawning courtiers, has largely written the US out of the script. David Gardner is international affairs editor at the Financial Times based in Beirut. Image courtesy US Department of State via Flickr.